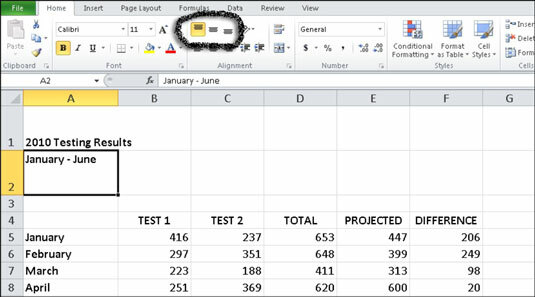 In Excel 2010, you can change the horizontal and vertical alignment of cell data. By default, text is left-aligned, and values and dates are right-aligned. Use the buttons in the Alignment group of the Home tab to alter the alignment. Values formatted as Accounting can only display as right-aligned. You can change alignment on all other formatting styles. Excel’s horizontal alignment options. The data in cells B4 through F4 are centered horizontally. Top Align: Aligns the data vertically along the top edge of the cell. Middle Align: Centers the data vertically in the cell. Bottom Align: This is the default option; it aligns the data along the bottom edge of the cell. Excel’s vertical alignment options. The title in row 1 shows the default bottom alignment; the subtitle in row 2 shows top alignment. You can view additional alignment options and align both the horizontal and vertical alignment at the same time by using the Format Cells dialog box. From the Home tab, click the Alignment dialog box launcher in the lower-right corner of the Alignment group. In the Format Cells dialog box that appears, set any desired alignment options on the Alignment tab and then click OK.